Do you want to reap the benefits of the advances in the fields of artificial intelligence and machine learning? With InterSystems IRIS and the Machine Learning (ML) Toolkit it’s easier than ever. 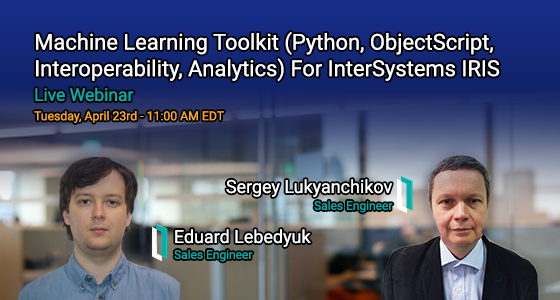 Join InterSystems Sales Engineers, @Sergey Lukyanchikov and @Eduard Lebedyuk, for the Machine Learning Toolkit for InterSystems IRIS webinar on Tuesday, April 23rd at 11 a.m. EDT to find out how InterSystems IRIS can be used as both a standalone development platform and an orchestration tool for predictive modelling that helps stitch together Python and other external tools. Good news! One more upcoming event is nearby. We're please to invite you to join the "J on the Beach" – an international rendezvous for developers and DevOps around Big Data technologies. A fun conference to learn and share the latest experiences, tips and tricks related to Big Data technologies and, the most important part, it’s On The Beach! We're more than happy to invite you and your colleagues to our InterSystems booth for a personal conversation. InterSystems is also a silver sponsor of the JOTB. In addition, this year we have a special Global Masters Meeting Point at the conference. You're very welcome to come to our booth to ask questions, share your ideas and, of course, pick up some samples of rewards and GM badges. Looking forward to seeing you soon! We're pleased to invite you to the DockerCon 2019 – the #1 container industry conference for all things Kubernetes, microservices, and DevOps. The event will be held at the Moscone Center in San Francisco from April 29 to May 2. In addition, there will be a special session "Containerized Databases for Enterprise Applications" presented by @Joe Carroll, Product Specialist at InterSystems. Please meet InterSystems at hub.berlin - Europe's interactive business festival for digital movers and makers on 10 - 11 April 2019 in Berlin. 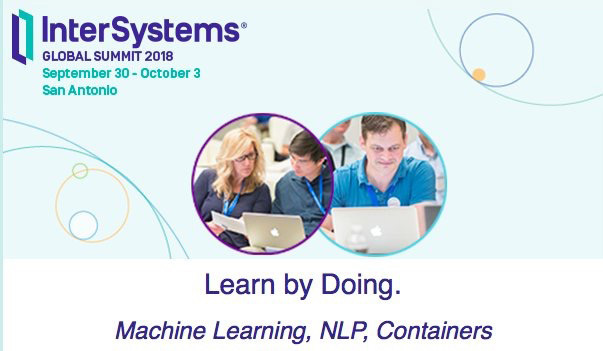 We look forward to two-day inspirational lectures and intensive technical discussions and invite you and your colleagues to our InterSystems booth for a personal conversation. In addition, we'll also present a keynote presentation and host a masterclass session. We're pleased to invite you to the DMEA 2019 in Berlin – Europe's largest event for the Health IT industry. We're pleased to invite you to the InterSystems Benelux Symposium 2019! 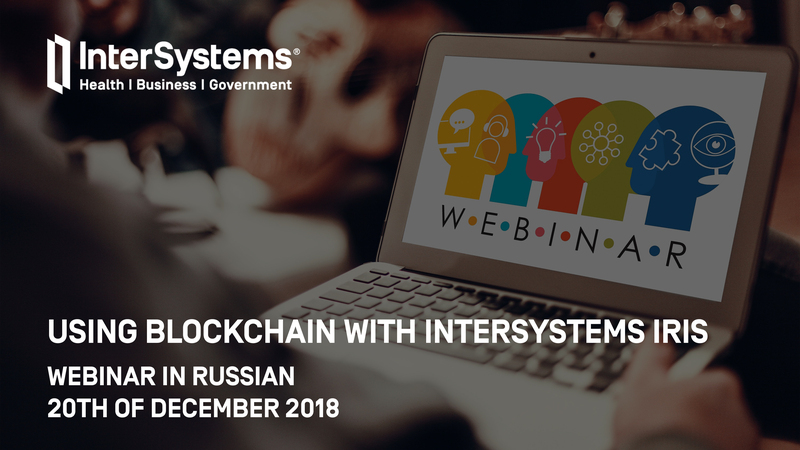 We are pleased to invite you to the upcoming webinar "Using Blockchain with InterSystems IRIS" on 20th of December at 10:00 (Moscow time)! 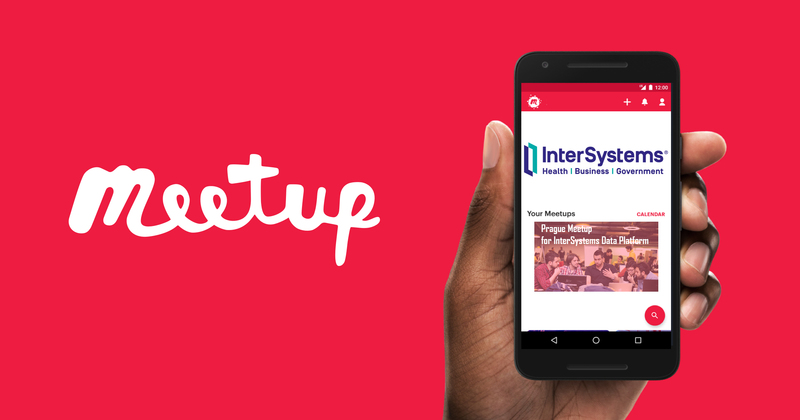 We are pleased to invite you to the Moscow InterSystems Developer Community Meetup on 11th of December! 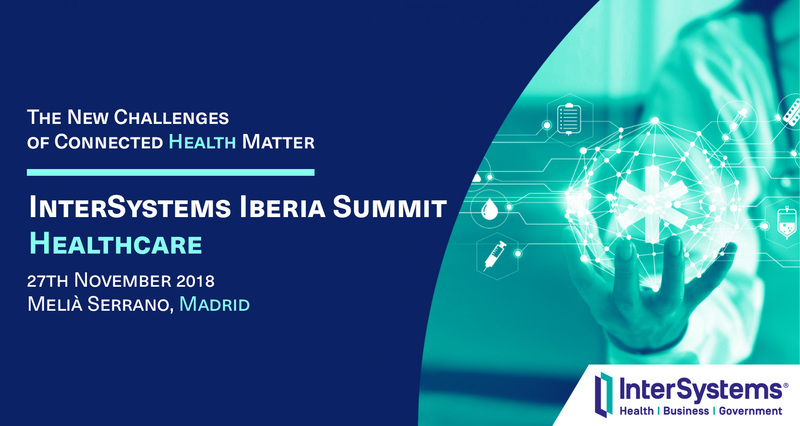 We are pleased to invite you to the InterSystems Iberia Summit 2018 on 27th of November in Madrid, Spain! Would you like to work on the next big game-changing idea in healthcare? How about partnering with healthcare innovation center where selected projects gain access to a unique pool of worldwide expertise? Or how about redefining usage of big data in diagnostics with the world’s fastest supercomputer? Or you might fancy changing the future of hospitals with your own new company? 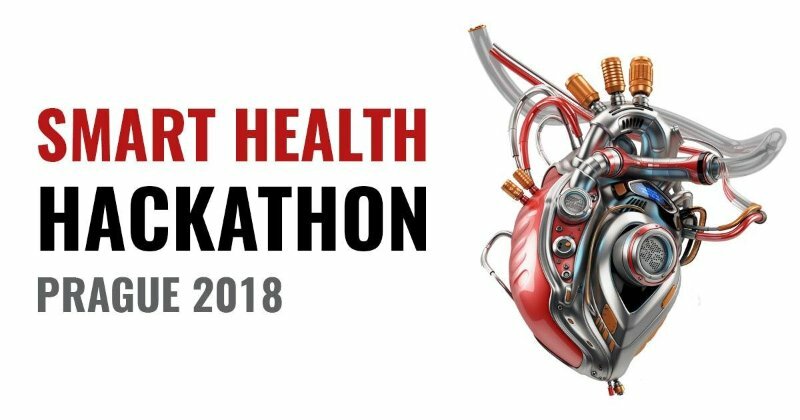 So, meet InterSystems at the CEEHACKS Smart Health Hackathon Prague 2018! We want to invite you to join the live broadcast in Developer Community Twitter! @Evgeny Shvarov and @Joseph Lichtenberg will present "Using Blockchain with InterSystems IRIS"! This session will cover the applicability of blockchain technology to address current business challenges, and will present a live application using InterSystems IRIS with blockchain integration. It will start in an hour! We are pleased to invite you to the upcoming webinar "Continuous Delivery Using Containers" on 21st of August at 10:00 (Moscow time)! Unconferences have been described as “networking on steroids.” They are the ultimate peer-to-peer discussion experience, and have been a vital part of InterSystems Global Summit for the past few years. Bring your laptop to the Experience Lab on Global Summit 2018 and engage with our technologies in a whole new way! We are pleased to invite you to the upcoming webinar "Taking Control of Your SQL Performance" on 12th of September at 11:00 a.m. EDT! 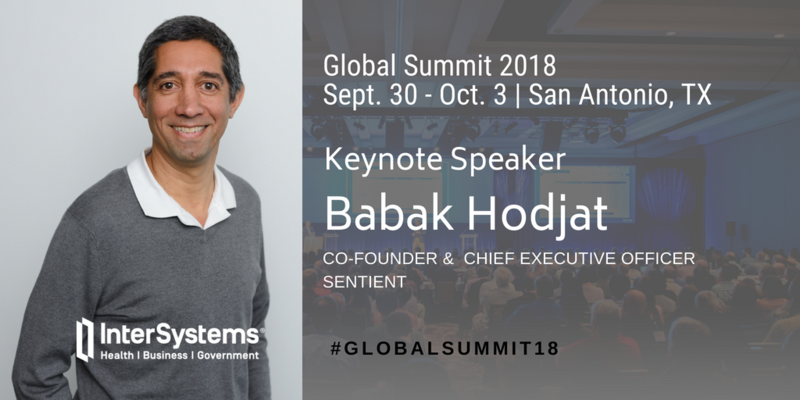 Global Summit will happen too soon, and I'm going to be there, as many of you I hope. You should register if still did not do it. Meet the Real Intelligence Behind the Artificial Intelligence. At Global Summit. 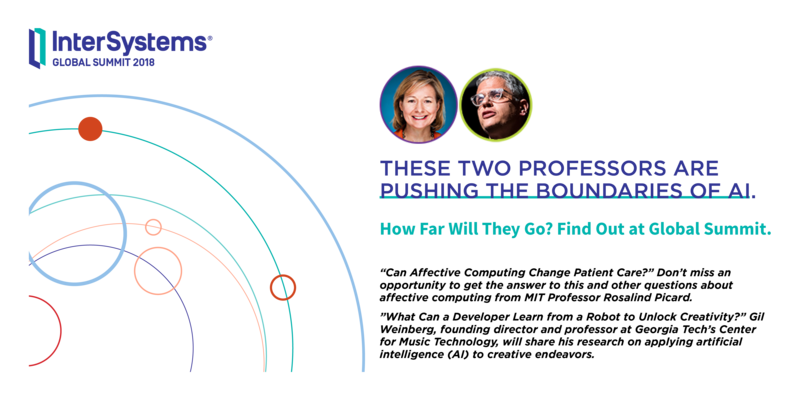 These Two Professors Are Pushing the Boundaries of AI. Get the Answers at Global Summit. "Can Affective Computing Change Patient Care?" Global Summit 2018 - Make sure you hang out till Wednesday! 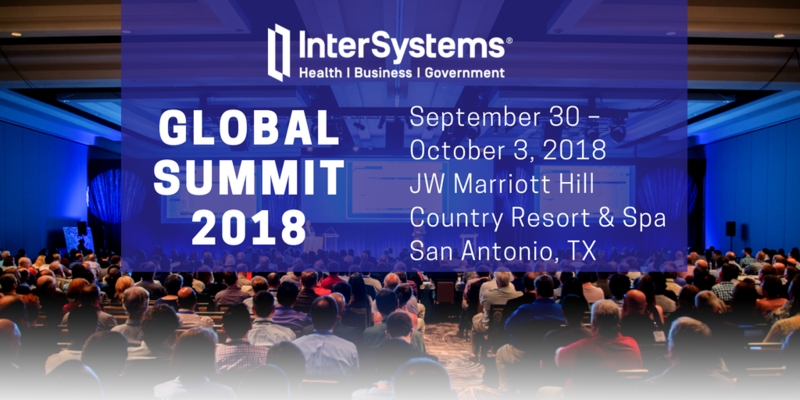 We’re now less than a month away from our annual conference, the InterSystems Global Summit. This year, we’ll be descending on the beautiful outskirts of San Antonio, a city worth visiting for its wonderful river walkway and its 18th century Spanish Mission, even if it hadn’t been the location of this year’s InterSystems event. Leaving the tourist guidance to the tourist guides, let’s take a closer look at what the conference has in stock for you, including a dedicated post-summit symposium on AI and ML on Wednesday October 3! Good news. We've just posted sessions for the Solution Developers Conference, including times, locations, speakers, and descriptions. Please take a look. Who, in the age of digital transformation, doesn't want to reap more benefits out of any process, procedure, and resource we have? 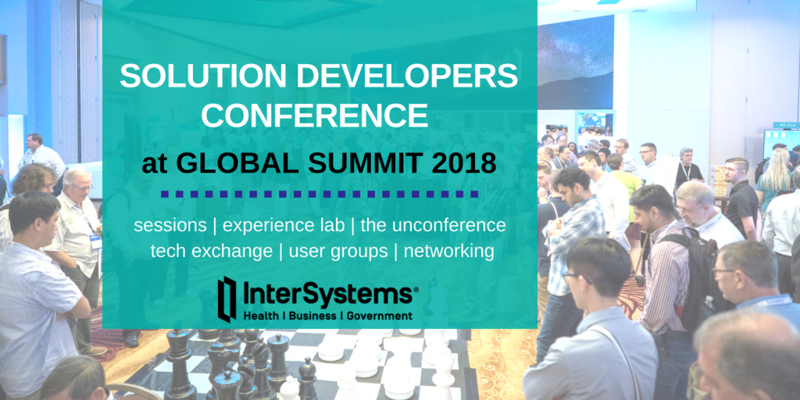 At InterSystems Solution Developers Conference (part of InterSystems Global Summit 2018) we will have sessions on how to improve the way applications are built with modern tools like Docker containers, Gitlab, Circle CI, Travis, etc., how continuous integration and continuous delivery (CI/CD) processes can help us deliver more value quickly to the end-user, and how we can start thinking about modernizing traditional applications. 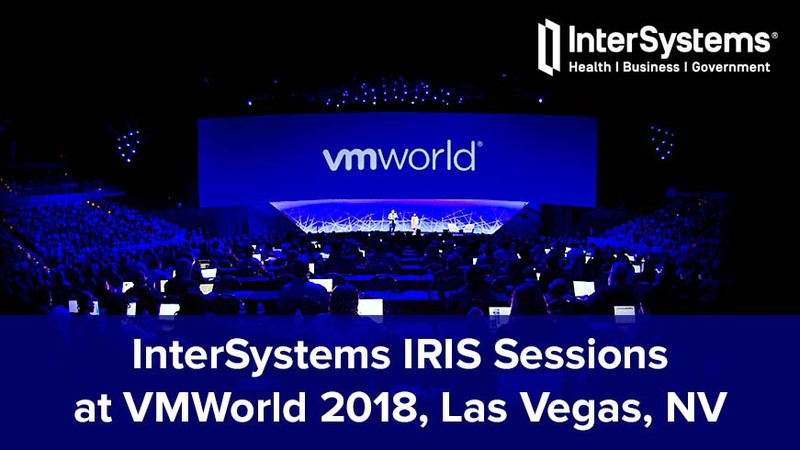 If you are attending VMworld Las Vegas remember to look for two sessions on InterSystems IRIS in the content catalog! Very soon, almost every product and application will include artificial intelligence (AI). 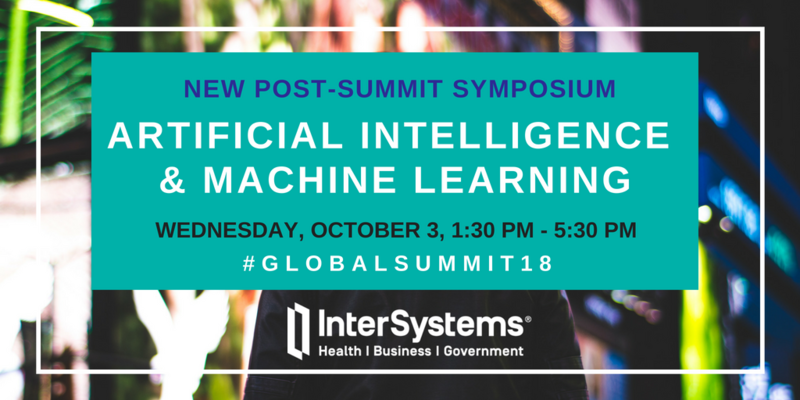 On the afternoon of Wednesday, October 3, at the Global Summit 2018 in San Antonio we’re pulling together experts from InterSystems and from the front lines of the AI industry to discuss the current and future state-of-the-art for AI solutions. Learn more about our Post-Summit Symposium: Artificial Intelligence and Machine Learning. Great News: Marketing got a confirmation this week that a leader in AI innovation will be the keynote speaker at a special AI event to be held at the Global Summit on Monday night. The previous webinar rescheduled due to technical issues. We are pleased to invite you again to the live webinar "It’s Machine Learning, Not Rocket Science!" on 31st of July at 11:00 a.m. EDT! 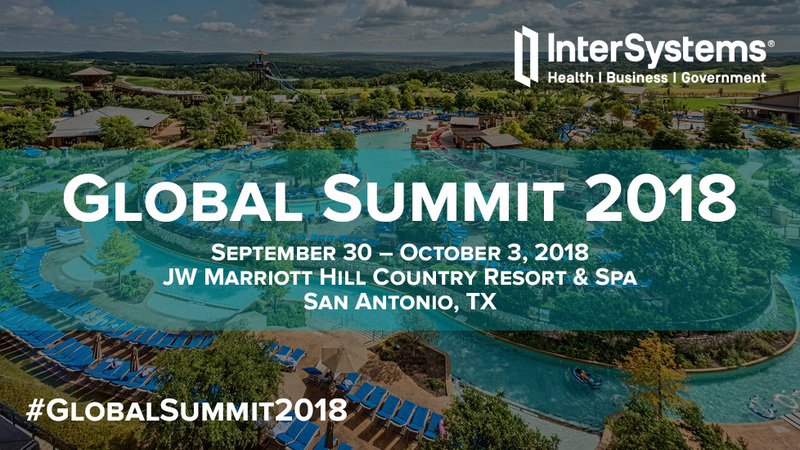 September is coming fast and so are plans for the Solution Developers Conference at our Global Summit 2018, September 30 — October 3 in San Antonio. (Webinar July 19) It’s Machine Learning, Not Rocket Science! We are pleased to invite you to the upcoming live webinar "It’s Machine Learning, Not Rocket Science!" on 19th of July at 11:00 a.m. EDT! User or developer working with Caché, Ensemble or other InterSystems products? Healthcare or banking IT professional? Or just a developer seeking new challenges? Come and join us for discussing what's up once you are in Prague, Czech Republic, or near by! We'll share news and experience on how to develop modern big-data, multi-model oriented applications. Please, feel free to ask your questions about InterSystems Meetup group in Prague. @Daniel Kutac and @Ondrej Hoferek will provide details. (Webinar June 22) It's Just Machine Learning, Not Quantum Physics! 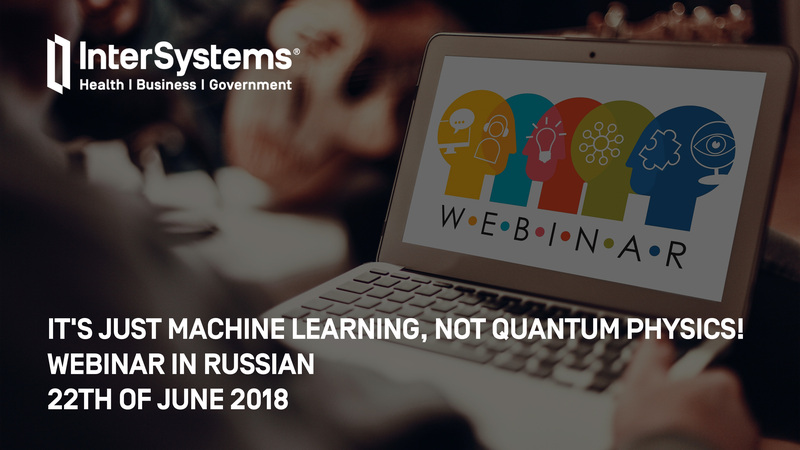 We are pleased to invite you to the upcoming webinar "It's just machine learning, not quantum physics!" on 22th of June at 14:00 (Moscow time)! 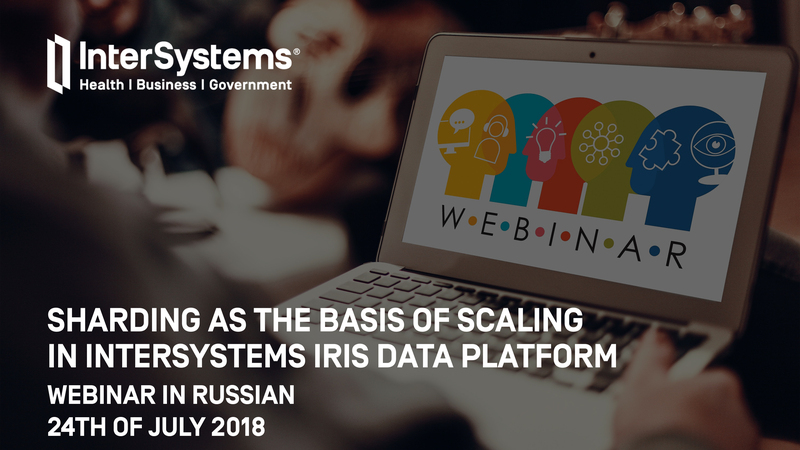 We are pleased to invite you to the upcoming webinar "Sharding as the basis of Scaling in InterSystems IRIS Data Platform" on 24th of July at 10:00 (Moscow time)!